Hello there and happy Friday! I'm on the Waffle Flower Crafts Blog sharing a stamper's version of glazed pottery. Stop by the Waffle Flower Blog to see the whole project and five gorgeous pottery samples! Happy weekend! This card is inspired by the amazing lesson from Kathy Racoosin. There's nothing that lady can't do with a marker and a white gel pen. Nothing. I used a Hero Arts poinsettia and chose an unconventional color for it: shades of teal, one of my favorite colors. And well, I followed Kathy's instructions when coloring it with markers, but still I didn't get a stunning contrast in the shades. I guess it's a matter of practice :) Oh, and I can't believe I haven't a single holly outline stamp in my Christmas collection. For the poinsettia center I used red stickles, and added a few white lines. Finished the card with a sentiment die cut with the Silhouette Cameo and heat embossed several times with red embossing powder. I love to do this! Good morning! Hope your weekend is off to a great start! Popping in quickly to share card two for Day 4 of the Holiday Card Workshop at Online Card Classes. I can't believe that for once I am more or less keeping with the pace! This card was inspired in the techniques shared by the delightful Laura Bassen. I had this little houses die from Memory Box and I thought they would be perfect for this technique. First, I masked and inked the background. Then, I die cut the houses from acetate to make my own stencil. I used the negative portion for the colorful houses, and then the positive (the actual acetate little houses) to add the doors and windows with white pigment ink. A LOT of masking tape and posts it were involved, ha! I used all Distress Inks. Tumbled Glass, Broken China and Chipped Saphire for the background, The houses -ala Bassen rainbow style- are Festive Berries, Mustard Seed, Mowed Lawn, Peacock Feathers and Picked Raspberry. The sentiment is Technique Tuesday. Hello there! And no, the title of this post is not wrong. I've jumped from Day 2 to Day 4 because my Day 3 watercolored cards are still on the making. So today I have three cards to share from Day 4 of he Holiday Card Workshop at Online Card Classes. This time it's all about one layer cards. My first one is based on Jennifer's lesson, a window card with partial die cutting. I went for a circle window where I fitted the lovely bow from Loved stamp set by Waffle Flower Crafts. I used the bow coordinating die. On the inside I stamped some images from the same set in Christmas colors. Everything was stamped with pigment ink, so I could clear heat emboss it. The reason for this is that I left the background inking for last, and the if flowers and vines weren't protected by the clear embossing powder, they would have smudged when I started blending the blue ink on the background. Hope that makes sense! Here's another pic. The sentiment is from a veeeeery old Hero Arts set that has lots of Christmas sentiments in every possible size and font. Ok, so there's the first one. Back later with more! Aaaand, here I am again! This makes my second card for Day 2 of the Holiday Card Workshop at Online Card Classes. You can check the first card here. This one was inspired by Chari Moss, who in yesterday's class showed how to create an adorable shaker card scene. I'm terrible for creating those super cute landscapes full of critters, but I managed to make a shaker card with two cutie birds, ha! I used the Bannerific set from Lawn Fawn. Such a classic! I think it's one of the first Lawn Fawn sets I owned. The sentiment is from a Simon Says Stamp Christmas set from maybe 2 years ago. To create the shaker portion, I stamped the banner on a die cut stitched panel and then trimmed just the inside portion of the banner using a craft knive. I also made a bit of paper piecing. The panel sits on a base that I embossed with a woodgrain folder to give the whole thing a bit of texture so it wouldn't look too plain. And we're done for today! Crossing fingers that I find the time for popping back tomorrow with my homework for day 3. Thanks so much again for visiting! Hey there! As promised, I'm back with my homework for Day 2 of the Holiday Card Workshop at Online Card Classes. Yesterday's lesson was about interactive Christmas cards, and I made two different cards: one inspired by Jennifer with a removable ornament and another one inspired by Chari's shaker card. In this post I'm sharing the first card. Another thing I did was adhering a kraft die cut star behind the ornament, with a sentiment heat embossed, so that when the ornament is removed the card still looks finished. For the edges of the card I made a scor-tape frame and heat embossed it with gold powder. There we are! Back later with my second card. Thanks for stopping by! And hello again! As promised, I'm back with a second card as my homework for the Holiday Card Shop at Online Card Classes. You can check my first card for today here. This one was inspired by Debby Hughes. Gosh, everything she makes is so perfect and dreamy!!! Not to mention the amazing photographs she takes. 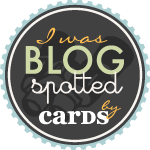 I highly recomment visiting her blog, inspiration abounds! Debby's video and card inspired me in the following ways: layout, a half gold embossed tag, die cut sentiment accross, ornament to the left. I die cut my tag from patterned paper. Instead of the gold splatters, I decided to add some interest to the background by scoring some diagonal lines. It's subtle but gives a bit of texture, and it's fast to do. The sentiment and berry branch were die cut with the Silhouette Cameo. Another quick way to mass produce shapes without effort. Once I had them die cut, I coated them in Versamark and heat embossed with red powder for the sentiment and white for the branch. I finished everything with some rhinestone-berries. Look at the gorgeous shine! Ok, I'm done for today! I don't think I'll be able to share homework tomorrow, but I'll be back on Wednesday for sure. Thanks again for stopping by!